The BHS Complete Manual of Equitation is the official handbook for all those learning to ride, or those who train horses, as well as being a fantastic guide to teachers of riding. This edition was coordinated by former BHS Chairman Patrick Print OBE FBHS and provides a solid insight into the art of equitation. It is a complete, authoritative training manual for horse and rider both on the flat and over show jumps and cross-country fences, based on sound classical principles that have stood the test of time. Whether amateur or professional, this book is valuable through the information it provides, based on sound classical principles that have stood the test of time. Newly revised, The BHS Complete Manual of Equitation is the official handbook for all those learning to ride – or those who train horses – as well as being a fantastic guide to teachers of riding. 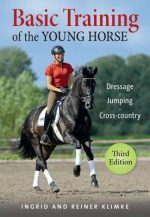 This manual includes information on: getting started, the rider’s basic position on the flat and over fences, early lessons, improving the lunge, cantering, jumping and riding out, the theory of aids, as well as including new chapters on the historical review, the scales of training, the training of the dressage horse, jump training and cross country riding.